I find it extremely perplexing that I have been the only one to report that there is a secret meeting in London where Kenneth Rogoff of Harvard University and Willem Butler the chief economist at Citigroup will address the central banks and advocate the elimination of all cash to bring to fruition the day when you cannot buy or sell anything without government approval. When I Googled the issue to see who has picked it up yet, to my surprise Armstrong Economics comes up first. Others are quoting me, and I even find it spreading as the Central Bank of Nigeria, but I have yet to find reports on the meeting taking place in London when my sources are direct. Other newspapers who have covered my European tour have stated that the “crash” of which I speak is the typical stock market rather than in government. What is concerning me is the silence on this meeting where there are more and more reports about a cashless society would be better. If we look at the the turning points on the ECM, yes they have been to the day when there has been a concentration of capital in a particular market. However, it has also picked the turning points in political decisions such as the formation of the G5 with 1985.65, the very day Greece asked for help from the IMF in 2010, to the day of 911. What we better keep one eye open for here at night is this birth of a cashless society coming in much faster than expected. Why the secret meeting? Something does not smell right here. Former U.S. Treasury Secretary Lawrence Summers urged countries around the world to agree to stop issuing high-denomination banknotes, adding his voice to intensifying criticism of a practice alleged by police to abet crime and corruption. Summers’s call coincides with a review by the European Central Bank of its 500-euro ($558) note, whose future now looks increasingly uncertain. President Mario Draghi repeated this week that the institution was considering withdrawing the euro area’s most valuable bill to avoid aiding criminals. First of all, why is this discredited buffoon still paraded around everywhere as if he’s an authority on anything other than hubris and ineptitude? The fact that fossils like Larry Summers still have such a prevalent voice amongst world leaders is precisely what Americans are revolting against in their support of Trump and Sanders. Interestingly, it appears Monopoly is ahead of the curve on this one. 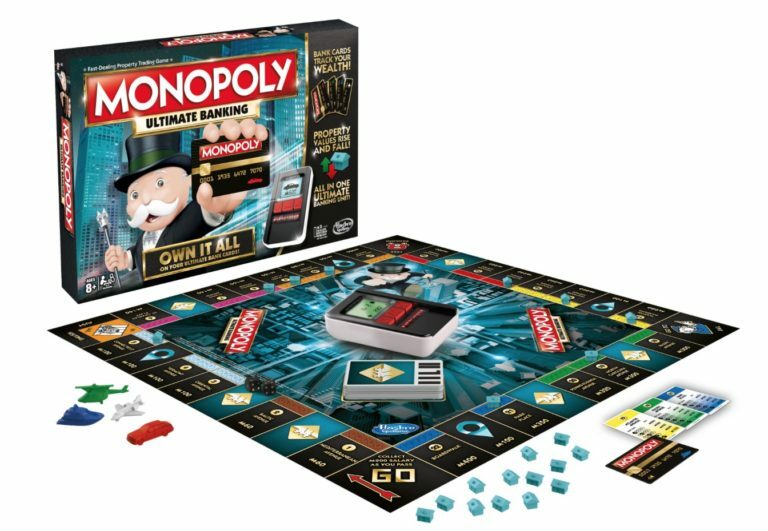 Indeed, while I first saw Monopoly move to “electronic banking” over three years ago, the board game’s latest iteration which will be released this summer, takes it to a whole new level. Is there anything worse in a game of Monopoly than thinking you’ve bankrupted another player only to discover they have a secret stash of cash hidden away? That’s no longer an option with the new Monopoly Ultimate Banking edition that uses a tiny ATM to keep track of every last financial transaction. It’s not the first time that Hasbro Gaming has tried to speed up the game of Monopoly by replacing cash with credit cards and an electronic banking unit. But ironically the company’s past efforts actually slowed the game down because players had to manually type in dollar amounts on an awkward keypad. But the compact banking unit in the Monopoly Ultimate Banking edition is able to quickly scan not only each player’s credit card, but all of the individual property and chance cards in the game which now include special bar codes on them. The latest version of the game, which will be available in the fall for $25, also mixes things up with new chance cards called Life events that can cause rents across the board to fluctuate, or other sudden financial changes that are really only easy to implement thanks to the game’s much-improved electronic ultimate banking unit. You know, like negative interest rates and deleting your entire bank account without warning, for example. “Ultimate” banking indeed. As the game’s cover suggests, the idea is to “own it all,” and they aren’t talking about you. Government say they are worried that criminals will use bitcoin. In truth, they are terrified that all the rest of us will. « If You Show Interest in Palestine, You Could be a Terrorist, Says Zionist Controlled UK Government?